Oregon State University chemists have discovered how to use the sun as more than just a way to harvest passive energy - they can use it to directly produce the solar energy materials that make energy harvesting possible. This breakthrough by chemical engineers at Oregon State University could soon reduce the cost of solar energy, speed production processes, use environmentally benign materials, and make the sun almost a "one-stop shop" that produces both the materials for solar devices and the eternal energy to power them. 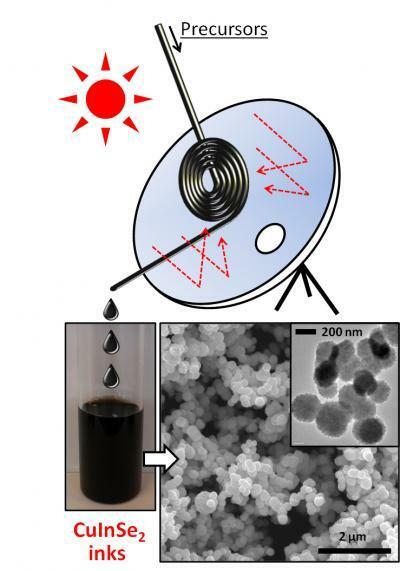 Writing in RSC Advances, they say the work is based on the use of a "continuous flow" microreactor to produce nanoparticle inks that make solar cells by printing. Existing approaches based mostly on batch operations are more time-consuming and costly. "This approach should work and is very environmentally conscious," said Chih-Hung Chang, a professor of chemical engineering at Oregon State University and lead author on the study. "Several aspects of this system should continue to reduce the cost of solar energy, and when widely used, our carbon footprint. It could produce solar energy materials anywhere there's an adequate solar resource, and in this chemical manufacturing process, there would be zero energy impact. "Our system can synthesize solar energy materials in minutes compared to other processes that might take 30 minutes to two hours. This gain in operation speed can lower cost." Another advantage of these thin-film approaches to solar energy is that the solar absorbing layers are, in fact, very thin - about 1-2 microns, instead of the 50-100 microns of more conventional silicon cells. This could ease the incorporation of solar energy into structures, by coating thin films onto windows, roof shingles or other possibilities.